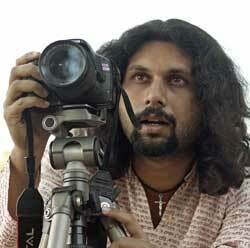 Odisha Channel Bureau Bhubaneswar, Mar 14: ‘Hoyto Kobitar Jonyo’ (In Poetic Hues), a short film made by Bhubaneswar based independent filmmaker Amartya Bhattacharyya, will have its world premiere in May at the prestigious 68th Festival De Cannes 2015 under the ‘Court Métrage’ section.This surreal film has been shot majorly in the areas around Udayagiri and Khandagiri, few shots in Barang, and a part in Kolkata, according to Bhattacharyya. The film, in Bengali and English, is a satire on the present day society where creativity is killed every day, either by economic pressures, or by political corruptions.Even the common man, suggestively shown as greedy opportunists, rejects creativity since it gives them no tangible benefit.In a fast-moving world of economic obsession, driven by dirty Politics, it becomes extremely difficult for creativity (a Poem) to find its place.Poem, or the creative spirit in a greater context, has been personified as a beautiful and traditional young lady, who keeps searching her Poet.She imagines her Poet to be her creator and her lover, and she feels committed to him, even though she knows that the Poet is dead.Rhyme, another character in the film, depicted as an alter-ego of Poem, is her only companion.In her search for Poet, the Poem meets Economy, Politics and Opportunists and comes to know that all of them have their personal motives to kill the Poet, because creativity hurts them all, in some way or the other.Poem and the Rhyme, both committed to the Poet, moves from their tormented present towards a dreamy past in search of their common lover.The film is made with a budget of less than two thousand rupees and without any industry involvement.To cut cost and have better control over the film, Amartya himself shoots, and edits his own films, apart from writing and directing it.All actors in the film are new faces, and Bhubaneswar based software engineers by profession, like Amartya himself.Amrita Chowdhury, the lead actress playing the character of a Poem in ‘Hoyto Kobitar Jonyo’, had earlier worked with Amartya as a choreographer and dancer in his Odia feature film ‘Capital I’, which was one of the six films in competition at the South Asian Alternative Film Festival, Paris, and was also officially selected at 13th Chalachitra Utsav, Bangladesh and West Florida Film Festival, USA.Swastik Choudhury was a part of all of Amartya’s previous ventures, mostly as an actor and Producer.Bikramjit Roy had acted in a supporting role in Amartya’s 2012 film ‘Niloye Jokhon’, a film that fought for the dignity and respect of prostitutes in our society.S K Ahamed Karim, Tamal Ghosh Dastidar, Mouli Malakar and Anshuman are the other actors, and this film marks their acting debut.The music has been composed by Kisaloy Roy, a Kolkata based classical trained musician who made his debut as a music director in Amartya’s bold independent feature film ‘Capital I’, which deals with a strong lesbian relationship.Few of Amartya’s earlier films are available online.His second Odia feature film will start soon.The script is ready, and the film’s shooting will hopefully begin by April or May. Earlier accomplishments of Amartya Amartya’s debut feature film ‘Capital I’ is the first independent feature film of Odisha.The film won international acclaim by making its place amongst the six films in competition at the South Asian Alternative Film Festival, Paris.The film was also officially selected at the 13th Chalachitra Utsav, Dhaka and West Florida film festival, USA.’Capital I’ marked the acting debut of the acclaimed Odia filmmaker Susant Misra, who was also the Producer of ‘Capital I’.Amartya’s films have recently been screened at various festivals round the world.His fantasy documentary ‘Shiuli – in search of my Goddess!’, a film that juxtaposes Goddess Durga as a lady love, has been screened at festivals in various parts of Europe including Germany, Portugal, Italy, Scotland, Belarus, Romania, etc, and also in USA.His film ‘Niloye Jokhon’ dealing with the life of a prostitute searching for her dignity and respect, was greeted at the Human Rights Film Festival of Barcelona/New York and Paris towards the end of 2014.His recent experimental fantasy documentary ‘Benaras – the unexplored attachments’ was officially selected and premiered on Feb 21 at Sahar International Short Film Festival 2015, at Greater Manchester, UK.Some of his films are publicly available on YouTube.Amartya had earlier been awarded Best Director at White Screen Film Festival 2013 and Best Editor at Rolling Frames 2013 for his short poetic psychodrama – ‘Boba Mukhosh’.